COLUMBUS — Urban Meyer’s ability to find and recruit talent is not limited to the players he puts in uniform. Meyer also seems to have sharp vision when assessing coaching talent. The Meyer coaching tree has seven former assistants who are leading football programs in some of the top leagues in the country, including the SEC, Big 12, Pac-12 and Big Ten. Rutgers’ first-year coach Chris Ash, who will bring the Scarlet Knights into Ohio Stadium on Saturday, and Maryland’s D.J. Durkin, also in his first year, are the two most recent former Meyer assistants to become head coaches. Ash was Ohio State’s co-defensive coordinator in 2014 and 2015 and Durkin worked for Meyer at Bowling Green as a graduate assistant and at Florida as a full-time assistant. Former OSU offensive coordinator Tom Herman is Houston’s coach. Texas coach Charlie Strong worked for Meyer at Florida and Mississippi State’s Dan Mullen was with him at Florida, Utah and Bowling Green. Boston College’s Steve Addazio and Marshall’s Doc Holliday were assistants for Meyer at Florida and Oregon State’s Gary Andersen was an assistant for one year at Utah when Meyer was there. The coaching connections to Ohio State and Meyer go beyond the head coach level. Rutgers offensive coordinator Drew Mehinger, running backs coach Zach Kuhr, head strength coach Kenny Parker and four other people in support and recruiting positions worked at OSU under Meyer. There are coaches on Ohio State’s staff, like offensive coordinator Ed Warinner or co-defensive coordinators Greg Schiano and Luke Fickell, who could get to run their own programs in the future. Earlier this year, Meyer talked about what he tells assistants considering taking a head coaching job. “My advice is don’t be jumpy. You only get one shot and if you fail you’re probably done,” he said at the Big Ten media days. “Chris (Ash) wanted to be a head coach, Tom Herman wanted to be a head coach. Chris came to Ohio State for that reason. He wanted to compete for a championship and be a head coach. “My advice is recruiting is the name of the game. If you can’t recruit there, don’t do it. You can be the greatest coach in the world and if you can’t get players to your school, don’t do it. That’s why I think Rutgers is so appealing to him. When Rutgers put the contract on the table, my advice to him was that is as good a high school football (in New Jersey) as there is in the country,” Meyer said. Earlier this week, Meyer said he always expects some of his coaches to search for head coaching jobs. “I want our guys to give us two good years and we’ll help you,” he said. “I also have had people on our staff that maybe spent too much time and I’ll have to tap them on the shoulder and say quit worrying about it. Bear Bryant had a great quote, I can’t remember it verbatim, but it’s actually in our coaches manual and that’s, if we do well, you’ll receive your reward. If we do poorly, you will not. “So the best way to get a head coaching job is do the best job you possible can and when someone calls then we’ll recommend you,” he said. 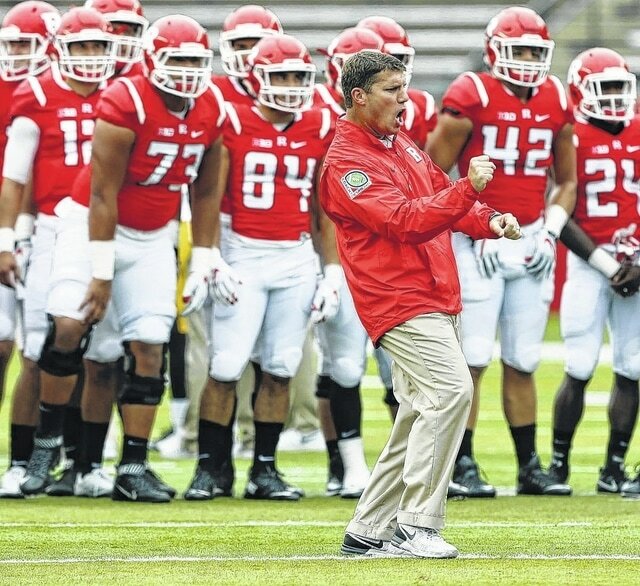 Rutgers head coach Chris Ash during pre game warm up with players before NCAA college football game against Iowa. http://aimmedianetwork.com/wp-content/uploads/sites/38/2016/09/web1_Ash2.jpgRutgers head coach Chris Ash during pre game warm up with players before NCAA college football game against Iowa.